Easy access: Sunway Nexis is touted as the latest integrated hub in Kota Damansara. The Christmas edition of Sunway Integrated Properties Show has drawn close to RM30mil in sales. A three-day event held at Sunway Pyramid, the show featured more than 10 residential and commercial properties in the Klang Valley as well as Ipoh in Perak. Those who purchased units from the three highlighted properties at the show – LaCosta at Sunway South Quay, Sunway Nexis at Kota Damansara and Sunway Velocity in Kuala Lumpur – received several goodies such as a 10% rebate and RM10,000 down-payment with a 12-month installment. The developer also promised to bear the interest during construction, and legal fees on the Sale and Purchase Agreement. Sunway Group property development division Malaysia chief operating officer Ong Ghee Bin said the promotion made it easier for people to own properties. Elaborating on the properties, Ong said LaCosta, which was launched in mid-2011, was 50% sold. The unique lake-front condominium boasts a sandy beach pool – one of its kind in the market. Sunway Nexis, a commercial development, houses business suites, SOHO suites and retail shops. “We improved the features of Sunway Giza by providing connectivity between the ground floor and the upper floor of the retail shops. “An MRT station is less than 100m away and we will link it to our development to provide convenience for our customers,” Ong said. Better features: The main highlight of LaCosta Lakefront Condominium is the sandy beach. On the other hand, Sunway Velocity is an integrated development featuring five Vs — V Retail, V Office, V Residence, V Boulevard and V Garden. It is located next to two MRT stations. “We are still exploring the possibility of adding a hotel into this development,” Ong revealed. For details, visit www.sunwayproperty.com or call 03-5639 9000. PETALING JAYA: Research analysts have mixed views on the stocks of property developers, with some saying that the oversold shares are due for a rebound while others are quite negative on the sector. Some analysts also recommended real estate investment trusts (REITs) as defensive plays, given the uncertain outlook for growth in property development. RHB Research Institute upgraded the property sector to “neutral” as it believed that the current valuations of property stocks had largely reflected the sector's negative factors. CIMB Research, which downgraded the sector from “overweight” to “trading buy”, said property stocks should at least enjoy a rebound as they were oversold. OSK Research maintained a “neutral” call on the sector, and said while global economic uncertainties might dampen property buying sentiment, the low interest rate environment and flush liquidity in the banking system would continue to shore up demand. However, Kenanga Research was quite bearish on the property development sector, and maintained its “underweight” rating on property developers. Kenanga Research expected property demand and capital values in 2012 to moderate to a 5% year-on-year in transactions value growth, due to recent government cooling measures, buying caution in light of global economic uncertainties as well as a “breather” after two consecutive years of record demand. RHB Research said the outlook for the property sector remained challenging and fundamentals were still “wobbly”, as property sales were largely driven by gross domestic product (GDP) growth. 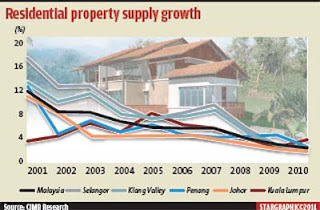 “Given our GDP growth forecast of 3.6% for 2012, we expect property sales to slow to 5% after a 20% growth in 2011 (annualised),” said RHB Research. Kenanga Research opined that the medium to large-sized property developers such as UEM Land Holdings Bhd, SP Setia Bhd, Mah Sing Group Bhd and UOA Development Bhd were overly bullish in their 20% to 60% year-on-year sales growth targets this year. There are signs that financial institutions are more cautious in lending to real estate buyers nowadays. However, CIMB Research noted that the recent performance of property companies' share prices had diverged from the real property sector's achievement in terms of sales and profits. 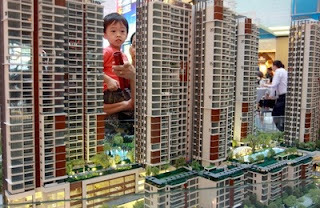 The research unit said that fundamentally, property companies should continue to do well in 2012. Key headwinds including slowing GDP growth (potentially from 5% in 2011 to 3.8% in 2012) should be more than offset by cheap (stock) valuations, continued record new sales and robust earnings growth. OSK Research also pointed out that the downside risk for property prices should be mitigated by lack of equivalent investment options, as property investments offered an attractive hedge against inflation. According to CIMB Research, there is a robust outlook for the residential market despite strong price gains in the past two years. It was noted that the growth of residential property supply throughout Malaysia had declined over the past 10 years. The increase in residential property supply in 2010 was among the lowest ever, which had contributed to the strong appreciation in prices over the past two to three years. CIMB Research said with the drive to transform Greater Kuala Lumpur into an outstanding capital city, the population was forecaste to rise from six million currently to 10 million by 2020. “It is estimated that one million homes would have to be constructed to meet the requirements of an enlarged population base,” it said. OSK Research concurred, and said the residential market was expected to remain rather encouraging in 2012, although some developers might become more cautious on the outlook for high-end landed and high-rise residential units. “We expect developers to shift to the more affordable mass-market housing segment to tap the high demand by first-time and young buyers,” said OSK Research. Kenanga Research also said affordability would be the theme amidst signs of slowing property demand growth. However, the outlook in the commercial sector is weak. CIMB Research noted that the glut of office space in the Klang Valley would worsen as more supply cam onstream in the coming years, with flattish rentals as occupancy rates continued to fall. “Retail space is the only bright spot but even then, the market is polarised, with leading malls still doing well and most of the others languishing,” it said, adding that the huge impending supply of office space over the next few years would continue exerting downward pressure on rental rates. , with landlords who were recording occupancy rates of below 50% expected to lower rental rates. Meanwhile, Kenanga Research is maintaining its “overweight” rating on Malaysian REITs, which are likely to hunt for acquisition opportunities in 2012 as the office and retail sector may face weaknesses in capital values because of incoming oversupply. It noted that Pavilion REIT had done well with a 17% share price appreciation since its recent listing. Kenanga Research has “outperform” calls on CapitaMalls Malaysia Trust and Axis REIT, with target prices of RM1.57 and RM2.78 respectively. RHB Research also said it remained positive on retail REITs. Centralised: An artist’s impression of Glomac’s BU Centro development. 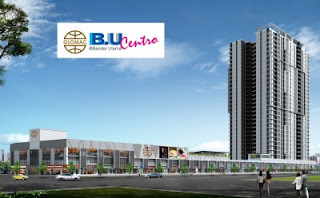 Glomac Bhd recently launched the shop offices in their mixed development called B.U. Centro @ Bandar Utama. The mixed development is sited on 7.62 acres near Bandar Utama. Phase 1 will consist of two-storey shop offices and a 31-storey serviced apartment building. 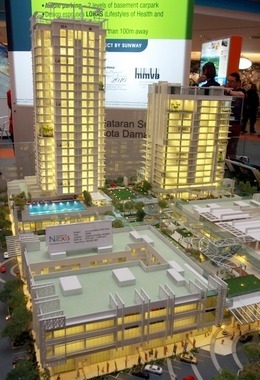 According to Glomac, the combined gross development value for the shop offices and serviced apartments is RM370mil. The developer added that the take-up rate for the shop offices was more than 50%. The 54 units of shop offices will feature a modern concept with full glass windows and wide frontage of 25 feet. The built-up sizes for the shop offices will range from 1,755 sq ft till 3,175 sq ft.
Average price for the shop offices is from RM771 per sq ft.
Each en-bloc unit comes with strata titles and car parks. Meanwhile, the 344 units of serviced apartments are now open for registration and will tentatively be launched early next year. The apartments come in four different types, with built-up areas ranging from 1,149 sq ft to 1,640 sq ft.
With wide lobby entrances, double-volume ceilings and a three-tiered security system, the apartments are expected to be popular with buyers. 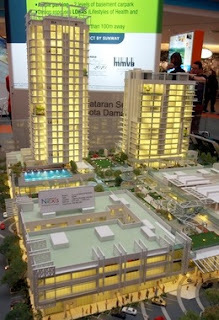 Prices will be from RM596,700 onwards. These modern, tropical-concept serviced apartments will provide facilities such as swimming pool, skylight, children’s playground, clubhouse and multipurpose hall, and tennis court. The B.U. Centro @ Bandar Utama development is expected to benefit greatly from the large population nearby, as it sits in the midst of lively and well-established neighbourhoods such as Bandar Utama, Taman Tun Dr Ismail, Damansara Utama and Mutiara Damansara. For further enquiries, call 03-7801 9000 or www.glomac.com.my. Pleasant affair: Nong Chik (centre) and Ahmad Fuad (left) with representatives from the TTDI Market Traders Association and the TTDI Residents Association. NO decision has been made yet on the proposed redevelopment of the 25-year-old Taman Tun Dr Ismail (TTDI) Market, although an agreement has been reached between the stakeholders and the authorities. Federal Territories and Urban Wellbeing Minister Datuk Raja Nong Chik Raja Zainal Abidin confirmed recently that Kuala Lumpur City Hall (DBKL) had received an application to redevelop the market land but no decision had been made on the proposal. “Everything is still in the negotiation stage and it is a long process,” he told reporters after meeting the TTDI Market Traders Association and the TTDI Residents Association. However, Nong Chik said the stakeholders would be included in future discussions and their views on the development of the site taken into consideration. It was reported that Kuala Lumpur mayor Tan Sri Ahmad Fuad Ismail, who was also present during the meeting, had said recently that a developer had submitted a proposal for the development of the market land but that City Hall had yet to approve the project. DBKL had received an application from WCT Sdn Bhd and Perdana Padu Sdn Bhd to redevelop the market site. About 100 traders and residents staged a peaceful demonstration in front of the TTDI market on New Year’s Eve against the demolition of the market. Nong Chik said during the meeting both associations had voiced their views on the redevelopment of the market. “They want the market to remain at the site. The developer would have to take into consideration all their views,” said Nong Chik. The traders want the market complex to be retained with a multi-storey carpark and a link to the MRT station built on the site. “The government will try to find a win-win situation for all the parties,” he said. Also present at the press conference were TTDI Market Traders Association chairman Jenny Loo and TTDI Residents Association chairman Mohd Hatim Abdullah. GEORGE TOWN: Cititel Hotel Management Sdn Bhd (CHM), a subsidiary of IGB Corp Bhd, is set to introduce two new hotels in this heritage city. Construction on 0.4ha for both hotels in Jalan Magazine began in September last year and the hotels are expected to open for business in 2014. CHM managing director Datuk Eric Lim said the gross development value for the new four-star St Giles Hotel and three-star Cititel Express Hotel was about RM180mil. “St Giles Penang will house a grand ballroom with a seating capacity of 1,200, several meeting rooms, a cafe, swimming pool, gymnasium, health centre, executive lounge and a helipad,” he told reporters after unveiling an 8.5m dragon made of recycled mineral water bottles at the Cititel Penang in Upper Penang Road here yesterday. He said the hotels, which would be built back-to-back to each other, were scheduled for completion in the first quarter of 2014. He added that the 32-storey St Giles would have about 500 rooms while the 23-storey Cititel Express would have 270 rooms. “St Giles Penang will be the first (of its kind) in Malaysia after two in England, two in the United States and one in the Philipines,” he said. GEORGE TOWN: Cititel Hotel Management (CHM) Sdn Bhd, a subsidiary of IGB Corporation Bhd, will invest RM183 million to build two more hotels on the island. 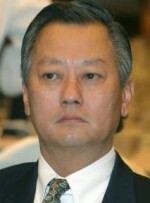 CHM managing director Datuk Eric H.K. Lim said the properties would be built at the Gat Lebuh Noordin area by early 2014. The two hotels are the four-star St Giles Hotel and a budget hotel - Cititel Express. The 33-storey St Giles will have a unique facility of a helicopter pad at the rooftop, while the Cititel Express will occupy 23 storeys. The St Giles Hotel will have 500 rooms and the Cititel Express will have 275 rooms. Both these new hotels will be built adjoining each other at the site. Speaking at a function to mark Cititel Penang's 15th anniversary celebrations here yesterday, Lim said the St Giles Hotel will be the fifth edition under the St Giles Hotel Group, with other hotels in the US, the UK and the Philippines. The Cititel Express will be the second after Cititel Express in Kota Kinabalu. He said the groundwork for the two new properties had already started in December and work was expected to be completed by 2014. 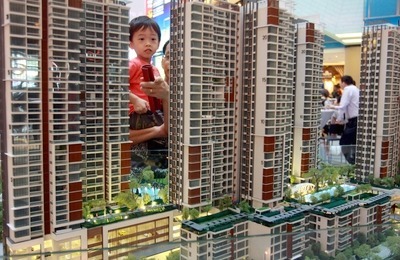 HONG KONG: The real estate market here is tipped to extend recent falls this year, analysts said yesterday, as property transactions dived to a five-year low in 2011 after a slew of measures to curb prices. Leaders in the southern Chinese city have been trying to control prices, which have become a major headache for the government amid growing disquiet among its seven million population over the rocketing cost of owning a home. The government has imposed new taxes and staged a series of land auctions to boost supply and bring down prices - helping to tame one of the world's least-affordable housing markets. A total of 108,814 properties changed hands in 2011, down 33 per cent from 162,739 a year earlier, according to official data released by the government's land registry yesterday. The volume was the lowest since 2006, when 99,087 deals were recorded. "The policies were meant to curb speculating activities but they are now hurting the market," Wong Leung-sing, research head at Centaline, one of the city's largest real estate agencies, said. He also cited rising mortgage rates and weak global economic sentiment for the fall, but said prices fell only about five per cent on average from their peaks seen in June last year - due to owners' reluctance to sell. Property prices rose 11 per cent in the first 10 months of last year, Dow Jones Newswires reported, citing government statistics. Buggle Lau, chief analyst at property broker Midland Holdings, said prices were likely to see a correction this year, and the slowdown could turn worse if global economic sentiment weakened further. "Prices are likely to remain flat overall, there will be a price adjustment - about five to 10 per cent correction," he said. "If the eurozone debt crisis deteriorates, definitely it will have some overall impact in the market but what is more important will be the Hong Kong government's policies." Despite the expected slowdown in the secondary home sales market, the primary market is likely to see an uptick with the launch of an estimated 16,000 new housing units this year, Lau said. "After all we are going to have a new chief executive this year, we are not sure whether the housing policy and some restrictive policies will change," said Lau, referring to Hong Kong's leader Donald Tsang, whose term expires in June. Wong said authorities should consider relaxing some restrictions to "let the market return to its normal activity". Property prices in Hong Kong, famous for its sky-high rent and super-rich tycoons, have surged over the past couple of years due to record low interest rates and a flood of wealthy buyers from mainland China. Following the slew of measures to curb prices, several government land sales last year were below market expectations, suggesting a cool down in the market. Tsang pledged in October to tackle the city's housing woes, acknowledging that "people have become frustrated" at the difficulty in affording a home. He also announced the resumption of a subsidised housing scheme for low-income residents, and promised to deliver 17,000 subsidised flats for sale from 2016 to 2019.